If you’ve made it to this page, you most likely read my whole book , or made it to the link on the last page. Thank you! 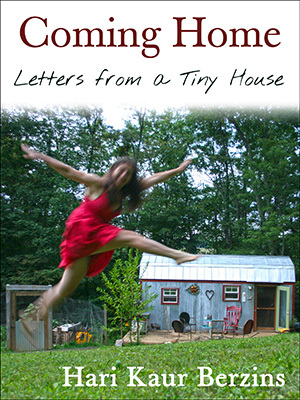 Since I released my first eBook, Coming Home: Letters from a Tiny House, I have thought a lot about where to take the blog and how/what to share. Thank you so much for supporting my work by buying my book. I told myself I wouldn’t read the reviews on Amazon, but I did. (Ouch–that’s embarrassing to admit) There are so many lovely words in support of my work! Thank you. There is one review, a radically honest one where the reader was looking for a different book–maybe a book I haven’t written yet–maybe my next book. And it made me think. I want to be of service and give clear ideas about how one can accomplish a mortgage-free lifestyle. Because of this reader’s review of my work and because I broke my own promise to not read the reviews, I learned something, and I’ve started to make a plan to focus my work to deliver more of what you want. I want to tell you everything, but I know you don’t need that. Everything interconnects, so I can’t talk to you about how I organize my tiny house bathroom without also telling you how it feels to live in a house with only a 6 inch mirror. I can’t leave out the part about the self-acceptance, vulnerability, and humility that tiny life brings on. I want to tell you about my kids and their amazing view of the world, and how just this morning we talked about the term hippy being used as an insult in their public school and what we could do about that. They teach me about living authentically in the world. But then I think–every mom thinks their kids are profound—they want to know how we got here, how we saved money, how we built a tiny house and bought land and installed a septic and a well and a driveway and are building a mortgage-free big house. 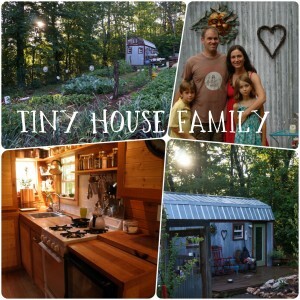 I realize that while the inner work of living in a tiny house is certainly important, the logistics are also important–it’s all about the big picture. So, if you stick with me on this process, I might just cover what you are looking for. I’m excited to announce that Karl is now working with me on sharing with you. Join us for our first online group coaching course, Radical Money: debt free on your terms. Read the entire course description here. We share our path, so that you can forge your own. We’ll help you to follow our footsteps to figure out what YOU will do. Your way will be as inventive as ours and unique to you. The time to live a happier life is now.